Dental implants have long been associated with a laundry list of negatives; outrageous cost, large amounts of discomfort during and after the procedure, time spent away from work and avoiding favorite foods are all commonly thought to be synonymous with dental implants. Fortunately, advances in technology and practices have made dental implants much simpler and easier than they’re commonly thought to be. Long-term costs are greatly decreased when compared to that of traditional dentures, and affordable payment plans are available for a wide range of budgets and financial situations. Discomfort is virtually nonexistent during the procedure, thanks to intravenous sedation and medications, and the time associated with surgery and recovery have been greatly reduced, thanks to advances in technique and technology. The technology used during the procedure has advanced beyond the usual selection of instruments, from custom, easy-to-install full sets of dental implant supported teeth to robotics that can guarantee advanced planning and incredible precision. Read on as we disprove four of the most common myths associated with dental implants. It should be noted that every patient is different; the information contained in this post is based on the typical patient that undergoes dental implant procedures. Cost is a major deciding factor for many people when it comes to dental procedures, and with good reason; a single dental implant can cost upwards of $4,000, while full sets can run into the tens of thousands.1 However, many dental practices have implemented cost-effective plans that allow a wide range of payment options for most budgets. While dental implants can be costly upfront, the long-term costs of dental implants are far less than the cost of maintenance and upkeep associated with traditional dentures. Dentures require periodic cleaning and maintenance and have a tendency to become loose when eating most foods. Damage caused by hard or difficult to eat foods can require costly replacements or maintenance that adds up over time. Dentures can also be lost or misplaced, meaning that another costly pair must be purchased to replace them. The cost of oral adhesives like Fixodent can add up as well, as they need to be periodically reapplied to dentures throughout the day, requiring a steady supply of funds reserved for purchasing more. Add in the cost of refitting dentures due to natural changes in a patient’s jaw, and the traditional denture user’s costs start to pile up. Getting permanent dental implants is a huge advantage when it comes to saving on long-term costs and maintenance, as the initial installation is the only procedure required, and seldom do patients have to replace or perform regular maintenance on their dental implants. This has never been truer than with the All-on-4® dental implant system; it’s a permanent, single-procedure solution with minimal maintenance in which four fixtures are inserted into the upper and lower jaw, and full sets of custom-made teeth are affixed to the implants. After the initial cost of the procedure, there are no further costs to consider, and affordable payment plans exist that open up a permanent, dependable solution for a perfect smile to thousands of potential patients. One of the most prominent stigmas of dental implants is the amount of discomfort associated with the surgery and the recovery post operation. While there could be minor irritation after the initial surgery, the actual procedure has none at all, thanks to intravenous anesthesia. Intravenous anesthesia involves the use of an IV to directly administer a sedative to the patient, relaxing them for the procedure. While the levels of sedation differ, the anesthetic is administered to calm patients and prevent discomfort during the procedure. Depending on the level of sedation, some patients won’t even remember much of the procedure or experience any feeling of discomfort. Most patients are able to return to normal activities within four to seven days and begin to eat normal foods within four to five weeks. This is especially true when patients choose the All-on-4 system; recovery time is usually three to four days, and three to four weeks is enough healing time to eat many foods comfortably. Regardless, the discomfort associated with procedure and recovery time that is synonymous with dental implant surgery has been rendered nonexistent during modern procedures and greatly reduced during the post-op period. Recovery experiences are far superior to other procedures’ experiences with the All-on-4 system, as the number of implants required to successfully affix the prothesis is fewer compared to the traditional system of one implant per tooth. Coupled with the false belief that dental implants offer a negative experience, the belief that they take time, with repeat operations and recovery periods, has largely become obsolete in the current world of cosmetic dentistry. Most dental implant procedures now require a single visit and can be completed in a day. As far as post-op time, most patients are able to return to normal activities within four to seven days and begin to eat most foods within four to five weeks. This is especially true when patients choose the All-on-4 system. The time usually associated with subsequent office visits has also decreased. Dental implants now require fewer follow-up appointments, with a few initial post-op visits required to make sure that the procedure is taking successfully. Then patients can spend time enjoying their new smiles and their favorite foods without the worry, maintenance and potential damage associated with traditional dentures. New technology like Yomi, a robotic arm system that assists dental surgeons in a number of ways, is limited to only a few dental practices. With haptic guidance and multisensory feedback, Yomi allows dental surgeons to be more precise in the angulation and depth of implant drilling. It also provides a real-time view of the patient’s jaw while the procedure occurs, allowing dental surgeons to have a complete view of the surgery from every angle, ensuring the safest and most successful dental implant surgery on the market today. Yomi is controlled by a dental surgeon during the entire procedure, combining a professional’s insight with the unmatched precision of an automated drilling system. 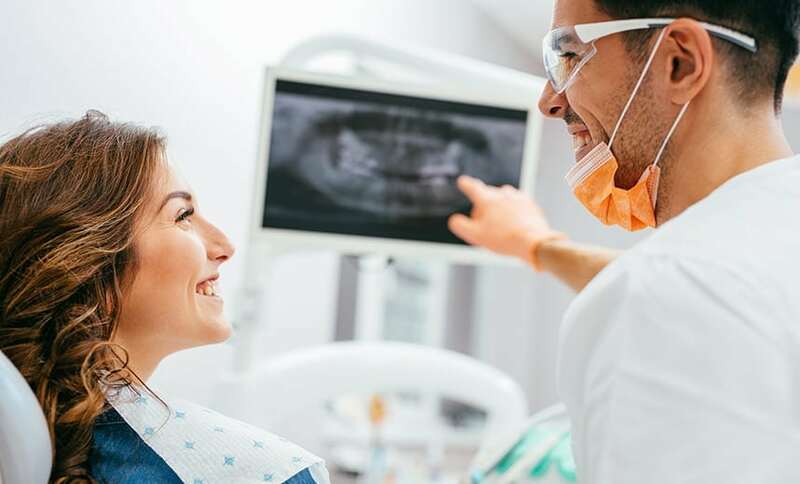 Digital X-rays emit less radiation and are developed in mere seconds, decreasing patients’ exposure to harmful radiation and allowing dentists to address problems quickly and efficiently. This is especially useful to dental surgeons, as they can plan procedures based on the unique needs of every patient by generating an accurate X-ray in seconds. All-on-4 implants is a dental implant system that is made up of full sets of teeth and arches and only requires four screws to be successfully implanted into a patient’s mouth. With robotics, digital X-rays and advanced implant systems, dental implants are now easier to implant than ever before. The dental implants of the past are just that—in the past. Advances in technology and procedure management have allowed for decreased time in the operating room and time spent away from work and other activities post operation. While the cost may seem significant initially, the long-term savings make them a great investment when compared to the upkeep associated with traditional dentures. Dental implants are a viable option for anyone who is tired of the discomfort associated with eating while missing adjacent teeth or dealing with upkeep of traditional dentures. Dental surgeons want you to be comfortable and relaxed during the procedure. They strive for your procedure to be accurate and effective for your situation and want patients to return to their normal routine and favorite foods as soon as possible. Most of all, they want their patients to be happy with their permanent, perfect smiles. Thanks to the advances in financial options, procedures, recovery time, pain management and technology, the happiness that a permanent smile from dental implants can provide is available to more individuals than ever. If you’ve been thinking about investing in your perfect smile, it’s time to book a free consultation today.